Guest post by Elizabeth Cawein. I always know I’ve had a good SXSW when I’ve lost count of two things: number of tacos consumed and number of new bands discovered. This year was a win in both categories, so much so that it’s taken me almost a month to recover and put together a proper recap of the highlights! I was honored to start off my week (truly, about an hour after my plane landed!) at the EU House, sharing some insights as part of a panel discussion on music export strategies. This is a topic I’m passionate about, and it was great to have the chance to highlight not just the economic possibilities of music export, but the cultural implications when we create opportunities for artists to build relationships and collaborations across borders. 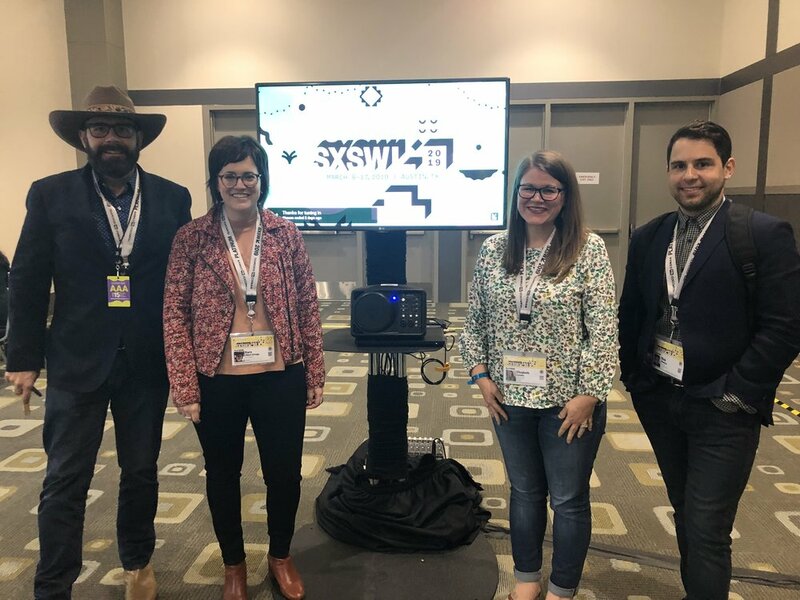 Later in the week I had the chance to experience GovCity, the first gathering of its kind of innovators in government, and meet some stellar young people as a SXSW music mentor. And of course, in between all of this I saw as much live music as I could! Naturally, I always love to check out what cities and countries are doing to represent at their own showcases and day parties, and this year was no exception – I took in bands at WeDC House, the Canadian Blast BBQ, Tulsa Boom Factory, and more. Sound Diplomacy was once again involved in organizing the German Haus at SXSW - 7 days of events around music, creative industries and tech - and I was glad to check out the new venue, meet my colleagues from Berlin and enjoy some live music. I also got to stop by the Recording Academy’s block party at the Four Seasons, another annual favorite, for some great live music presented by the Texas chapter. (And in case you missed it, they shared our Music Cities Manual on Grammy.com!). 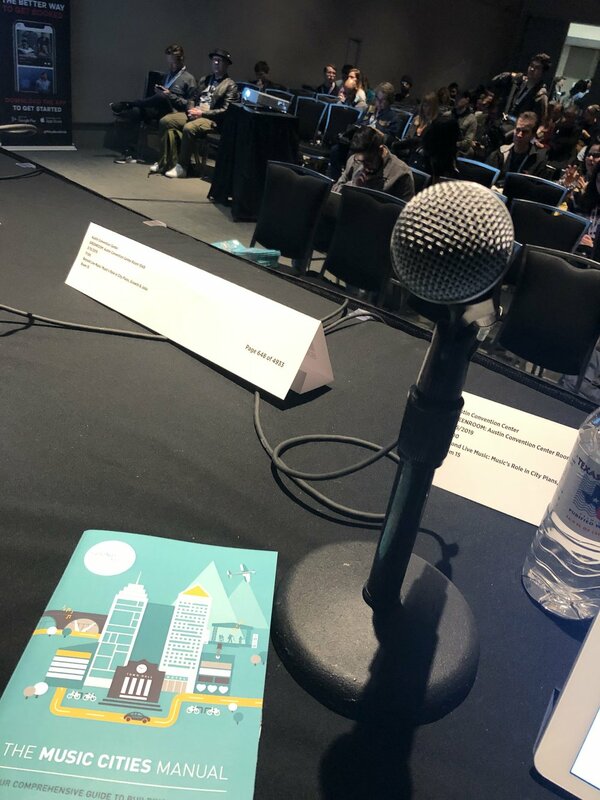 My SXSW week ended as strong as it started, with our panel on music cities – I was thrilled to see how many people came out to be a part of this conversation at 5 o’clock on the Friday of SXSW, when a cold beer was most certainly awaiting them anywhere else! That turnout – along with so many conversations I had throughout the week with folks from across the U.S. and around the world – is an indication of how important this topic is, and how many people are invested in the music ecosystems in their home towns and cities. I so enjoyed moderating this conversation with Matthew Kowal from Majestic Collaborations, Kara Elliott-Ortega from the City of Boston, and Nick Mattera from Brand USA. You can check our Music Cities Manual here. Furthermore, as part of 'Music Cities: The Impact of Music and Nightlife on Cities' programme at German Haus, Sound Diplomacy hosted a presentation on Music City Scope - an interactive model developed by the City Science Lab at Hafen City University, Hamburg in collaboration with Sound Diplomacy, Clubkombinat, and the Hamburg Music Business Development Association. Music City Scope is an interactive, digital model that analyzes the relationship between music and urban development and simulates development scenarios. The presentation session was attended by economists, researchers, business associations and night-time economy officials from European and US cities. I don’t remember the exact day, month or year that I became obsessed with music – I imagine it really set in far too early for my recorded memory – but I do remember when I became obsessed with music and cities. It was 2015, and I’d been spending the better part of the year working to build a nonprofit export office in my hometown of Memphis that would focus on leveraging our music for talent attraction, tourism and economic development, while creating a needed pipeline for our musicians to grow their national audiences. In the midst of that work I’d become interested in the interesting ways other cities – in the U.S. and across the globe – were approaching supports for their music ecosystems. Enter Sound Diplomacy and the Music Cities Convention, the first-ever in the states, held at Georgetown University in Washington, D.C. in October of 2015. I saw a Billboard story about the conference by chance and was immediately intrigued. But it was just a few weeks away, so I figured it wasn’t practical to try to make it work. I decided to check flights, just in case, sure that the last-minute price gouging would make the decision for me. Somehow, the flights were hovering around $115. Almost as soon as I closed my Kayak.com search tab, I had an e-mail from my husband – he would need to be in D.C. at the end of the month for a conference. The exact dates of the Music Cities Convention. If I didn’t think it was kismet then (I did), I certainly know it was now. That one-day event left me feeling the best kind of exhausted: my brain absolutely swimming with ideas, my passions ignited, and my preconceived notions smashed. I was hooked. At the close of the conference I marched up to Shain Shapiro, Sound Diplomacy President and Founder, and asked what I needed to do to bring the Music Cities Convention to Memphis. Two years later, that’s exactly what it did. 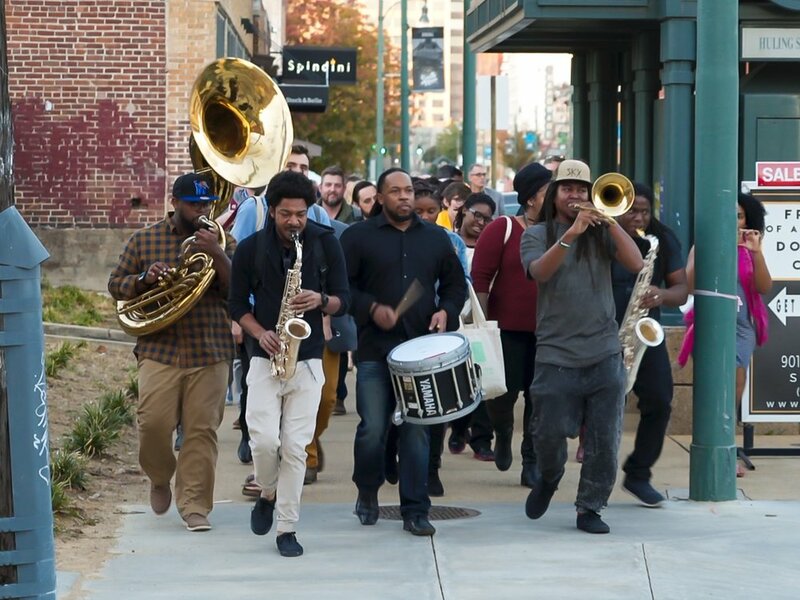 The Memphis edition of Music Cities Convention, held in October 2017, was in a way the beginning of my working relationship with Sound Diplomacy, as I spent a year working with them to put together the conference programming and logistics. A year later, I had the pleasure of working with the Music Cities team again for the Music Cities Convention in Lafayette, La., handling publicity and marketing for the convening. And in January of this year, we made it official. I’m thrilled to join the Sound Diplomacy team, especially at such an exciting time of growth with the opening of a new U.S. home base. The reality is that America traditionally has lagged behind the rest of the developed world when it comes to funding and supports for arts and culture, so to see so many U.S. cities interested in thinking about innovative ways to grow their music ecosystems and understanding the broad impact that a healthy music community can have for their citizens is exciting, and I hope a sign of a paradigm shift ahead. The prospect of being invited to so many incredible places to discover their music cultures and to help them realize the potential in their own cities is a thrill for my music-and-cities obsessed brain, and an honor. And beyond my hometown of Memphis – one of America’s richest and most important music cities – Sound Diplomacy is already working with some of my favorite American music hubs: New Orleans, Muscle Shoals and San Francisco. I also can’t wait to discover the music of Indianapolis, Fort Worth, and Huntsville. (And so many others I can’t mention just yet!) What I know to be true is that music makes our cities better. It drives economic impact, it creates jobs and attracts talent. It invites people to our cities, brings in hotel tax dollars and creates cultural connection through tourism. It improves education, it brings life to our neighborhoods. It gives us pride in a shared civic identity and makes us invest and care deeply in who we are as a city. And when our musicians thrive, our cities are full of creative people who can very often bring creative solutions to civic problems. When our musicians thrive, our cities thrive. I’m driven by that belief, and lucky to be part of an organization that believes it, too. SOUND DIPLOMACY IN THE U.S.
(NEW ORLEANS, LA) – Sound Diplomacy will open a U.S. office in 2019 to be headquartered in one of the country’s most revered music cities, New Orleans, it was announced today via an exclusive story in Billboard Magazine. The international consultancy, which has offices in London, Berlin and Barcelona, has already begun working with diverse U.S. cities to develop strategies for growing the economic impact of music, including historic music regions like Muscle Shoals and emerging music cities like Indianapolis and Fort Worth. The U.S. office – which will open a brick and mortar location later this year – brings with it the growth of Sound Diplomacy’s U.S. team and myriad exciting music and strategy projects from coast to coast. 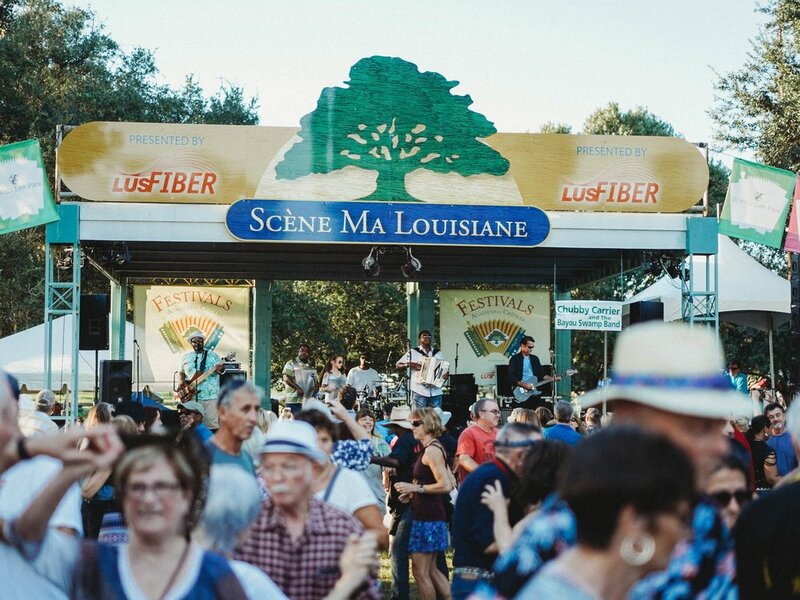 In January, Greater New Orleans, Inc., announced the launch of the New Orleans Music Economy Initiative, a comprehensive music strategy which will be led by Sound Diplomacy. Leading Sound Diplomacy’s expansion efforts in the U.S. is Shapiro, with the support of Elizabeth Cawein, a long-time music publicist turned strategist and advocate based in Memphis. 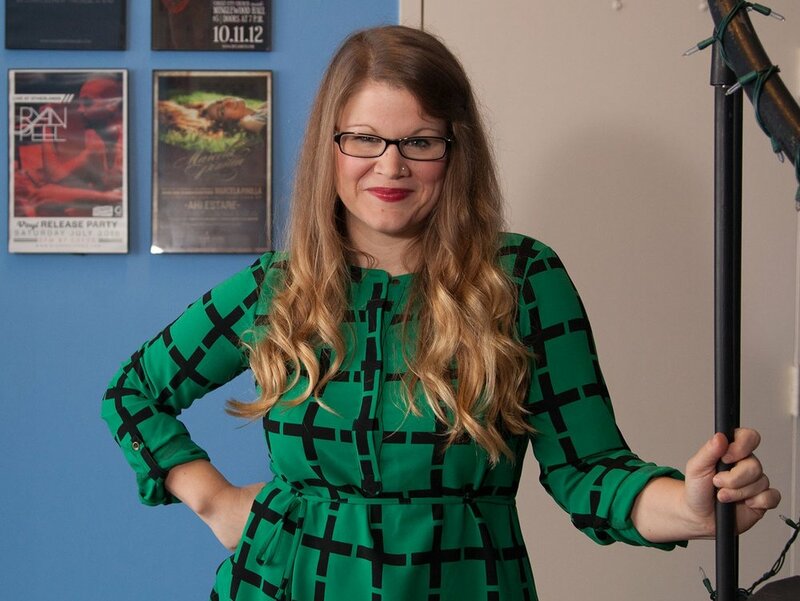 Cawein brings to the role eight years’ experience in music publicity and expertise on music ecosystem strategies gained through her work with Music Export Memphis, an innovative nonprofit that leverages public and private funding to act as an export office for the city’s music culture. In addition to previously announced projects in San Francisco, New Orleans, Huntsville and the Shoals Region, the story in Billboard today also mentions Sound Diplomacy North American projects in Indianapolis, Fort Worth, Northwest Arkansas, and Vancouver, Canada. With 10 events in three different continents, 2018 was a fantastic year for Music Cities Events. One of the highlights was the launch of our brand new event series, Nocturnal Cities, with two November editions taking place in Canada and Colombia. The events explored the important role played by the night-time economy and its relationship with city planning and welcomed a total of 410 attendees and 43 speakers from all over the world. 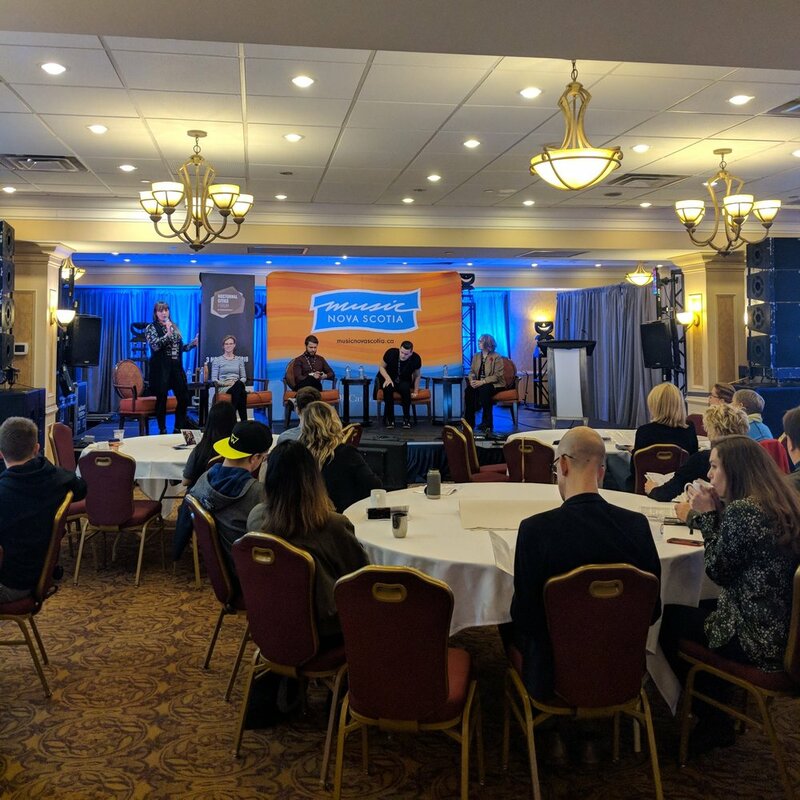 The inaugural edition of Nocturnal Cities Forum was held in Truro, Nova Scotia, Canada on November 3rd as part of Nova Scotia Music Week and the theme was “Building Stronger Music Communities”. 75 delegates from Canada and the world discussed the role of the night-time economy in a full day of panels, presentations and roundtables. November 22 saw Sound Diplomacy, Bogotá Chamber of Commerce and Bogotá Mayor’s Office host the first-ever edition of Nocturnal Cities Conference in Bogotá, Colombia. 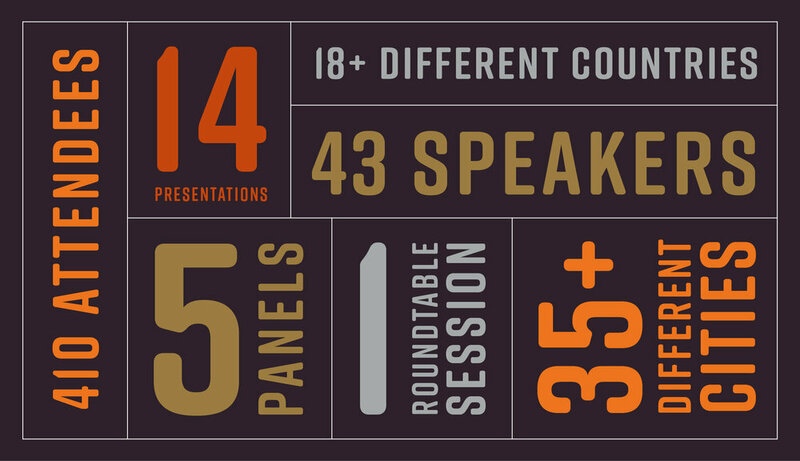 The Conference hosted 335+ delegates from all over Colombia and the world and featured a full day of panels and presentations, as well as an afternoon work session and an evening concert. 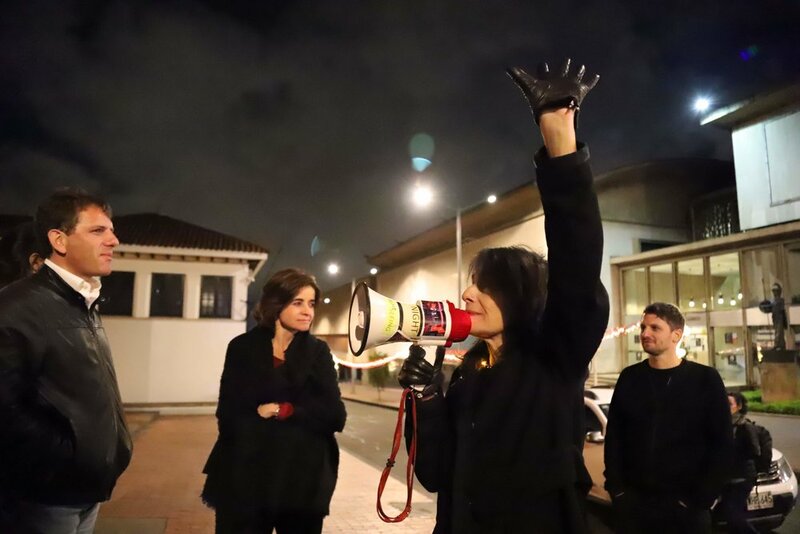 Prior to the events, Sound Diplomacy and Andreina Seijas published a Night Time Economy Guide outlining the benefits that the evening and night-time economy create, this laid the foundation for the ideas explored in the events. The conference also led to the creation of a Manifesto aimed at providing guidelines and strategies on how to improve the night-time economy in Latin American cities. The document provides a detailed analysis of the night-time economy and the challenges and opportunities that come with it. The document is now available for download here. The next editions of Nocturnal Cities Forum & Conference will be confirmed soon. In the meantime, have a look at our Bogota event report! We announced Julia Eberdal’s appointment as Sound Diplomacy’s new CEO, we’re so pleased to welcome her to the team. Read the press release here. To kick start the Sound Diplomacy events calendar for 2019 and to engage with an increasingly hot topic concerning the urban planning and culture sectors, we hosted Sound Development, our quarterly mini-series discussion at East London’s newest destination, Republic. Our event chair Kat Hanna has written a little overview of the event here. Earlier this month saw the launch of the Cultural Cities Enquiry report, looking at developing a new model to help culture flourish in our cities. Our Founder Shain Shapiro was part of the Board leading the Enquiry whose purpose was to "consider how we can radically increase the ability of our cities to use culture to drive inclusive growth". The report is now available to download here. We returned to the House of Lords for our penultimate session in our Music in Society inquiry, this month investigating the role of music in driving economic growth. Read more here. London’s Night Time Commission publishes the Think Night report that ‘sets out how London can work better for all Londoners from 6pm to 6am’. We were excited to hear news of a new venue in London’s White City area, read more here. A look back 60 years to The Day the Music Died. An oral history of Chicago's under threat local music venue The Hideout. A new study by the Berlin Club Commission finds that club tourism brings in an estimated €1.5 billion euros to the city each year. A creative visualisation of FUGAZI! Barcelona City Council has announced a new venue classification to protect its small venues. Paloma from our Barcelona office lays down a Diva themed playlist. In her words, "February is a tough month, so it's good to have some diva pep talk to support you!" This month we’re starting by heading to ITB in Berlin to promote our Music Tourism Convention, at the same time Danny will be at ILMC talking about how music can be used to boost tourism. We’ll also be at SXSW with lots of activity happening there and MIPIM. Come and say hello if you’re there! The first Asian Music Cities Convention is set to be our biggest event yet: find out why. 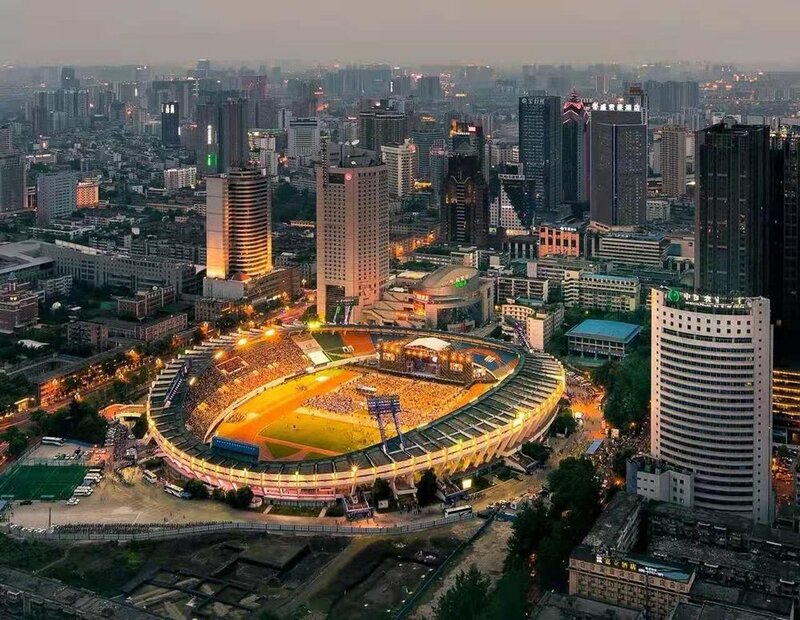 On 11-12 April 2019, Music Cities Events will travel to Chengdu for the first ever Music Cities Convention to be held in China. The event will feature two full days of panels, presentations and roundtables, a traditional Chinese dinner and performance, a concert, an amazing extra tourism and networking day and the guarantee to meet key representatives from all over the world. And have a look at the initial schedule here. 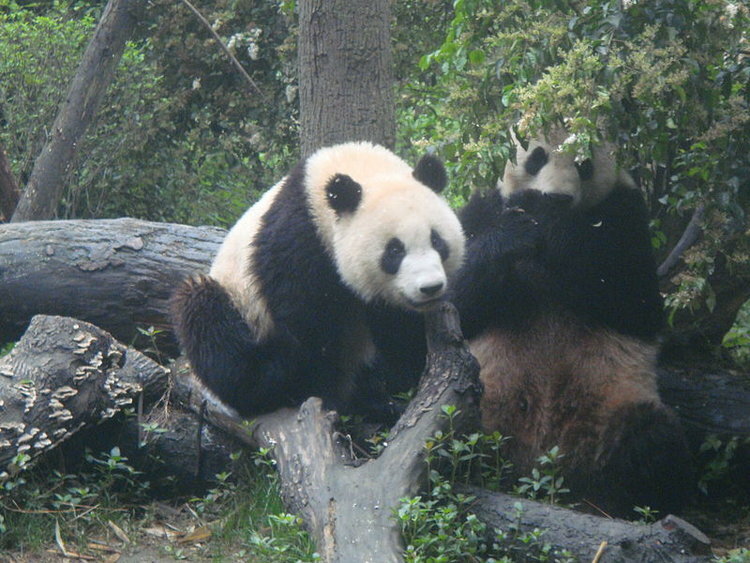 We can’t wait to meet you in Chengdu and discuss the role music plays in our cities. Our final Early Bird runs till 15th March and tickets are available at the special price of $145 USD. Get yours now by heading here. Guest post by Kat Hanna. To kick start the Sound Diplomacy events calendar for 2019 and to engage with an increasingly hot topic concerning the urban planning and culture sectors, we hosted Sound Development, our quarterly mini-series discussion at East London’s newest destination, Republic. We’ve invited our event chair Kat Hanna to provide an overview of the discussion from the event. Whether it’s the almost daily announcement of closures or the empty units that have left high streets looking like gap-toothed smiles, the need for high street regeneration is hard to avoid. Yet while the symptoms of their struggle may be obvious, the cause is harder to diagnose. Too much retail. Not enough quality retail. The rise of online shopping. The decline of community. As any well-assembled panel will tell you, the answer, of course, is that many high streets are struggling for a number of reasons, and so their regeneration will require a range of solutions. What these solutions have in common, however, is the ability to bring together a range of people to a specific place. In doing so, high streets not only offer what online shopping cannot – shared, embodied, human experience and interaction. The evening provided many examples of how music can help address the symptoms of a struggling high street. Dave Gray from Wrexham talked about the transformation of a former JJB Sports store into a community hub, focused around music, yet flexible enough to host exhibitions, meet-ups and all manner of events. Architects Tom and James Teatum emphasised the benefits of high streets that accommodate a range of uses, including residential and manufacturing, rather than simply retail. But to use music to simply fill empty retail units is to overlook the full potential of music – not just as a source of demand for space, but as a vital contributor to local economies, communities, and individuals themselves. Just as Julia Jones was keen to point out the regenerating the high street should be about more than rescuing retailers, music should be used to generate human interactions, as well as just cash transactions. Too often, the social and retail functions of the high street are presented as being in opposition to one another. In the recent past, there is perhaps some truth in this, as we today lament the passing of high street chains many communities once blamed for killing off independents. Yet as our discussion revealed, what works for the retail functions of the high street can also work for its social functions, and vice versa. Here’s three key takeaways that stand to benefit both these aspects of a successful high street. A range of spaces can attract a range of uses: A diversified high street means of mix of uses, and a mix of spaces. This requires a supportive, and perhaps more flexible planning system that encourages co-location and celebrates, or at least tolerates activity (including when its noisy and nocturnal). It requires developers to understand the nuanced needs of potential tenants, providing space suitable for both the production and consumption of music. Contrary to some assumptions, this does not always need to be specialised – as Achar Dillon of Killing Moon pointed out. Experience is everything: What high streets brands sought to offer based on cost and convenience can no longer compete in the age of online shopping. If retailers want to generate footfall, they must provide what cannot be offered with the swipe of a hand. Music may not be the only way of creating this experience, but its universality, adaptability and accessibility make it a particularly powerful way to do so. As Jennifer Wood from Southwark council highlighted, these qualities make music an increasingly common feature in social prescribing – addressing social, physiological and physical problems with non-medical, community-based solutions. Communicating value: The ability of music-related uses to animate or adapt of underused or ‘awkward’ spaces should not prohibit long-term investment in real-estate that supports the industry. This requires the music sector to focus on setting out its value, to local economies, high streets, and communities, ensuring that the sector is valued in its own right, not only as a tool used for placemaking or promotion. As Lawrence Jones from Trilogy emphasises, these principles extend beyond the built form of the high street. Successful spaces, including workplaces, are those that offer a mix of experience, that encourage interaction between users, and that can adapt to a range of use, not just during the lifetime of a building, but the daily routines of an individual. An experienced urbanist and researcher, Kat Hanna has worked in London politics, planning and policy for the past seven years. Her research interests include urban economies, transport, and the relationship between technology and the built environment. Kat joined Cushman and Wakefield in 2017, focusing on long-term mixed-use development projects in London and trends in how we live, work and move around in cities. Kat regularly appears as a commentator on urban affairs across a range of publications, media, and events, and was shortlisted for the EG Rising Star Award for 2018. Sound Diplomacy, the leading strategic consultancy using music to drive economic growth in cities and places all over the world is welcoming its first external Chief Executive Officer, Julia Eberdal. Julia will join founders Shain Shapiro, PhD and Jordi Puy; as well as Alexandra Notay, the Build-to-Rent Fund Director for PfP Capital, the fund management business of Places for People; Nicole Yershon, CEO of Lab for Hire and bestselling author of Rough Diamond, Turning Disruption into Advantage; Robert C. Hain (CEO & Chairman, City Financial); Derek Linfield (Legal Consultant and Chairman of Cornish Lithium Limited and Mkango Resources Limited); and Scott Cohen (Co-Founder, The Orchard and Co-founder, Cyborg Nest) on the Sound Diplomacy Holdings Board. Julia’s strong financial background and diverse skill set stemming from her previous roles covering business analysis, financial modelling, financial advisory and investments add a unique value proposal to Sound Diplomacy. Complementing the Sound Diplomacy teams’ established and well known background in Music and Creative Services, Julia holds an MSc in Economics and Business majoring in Finance from Stockholm School of Economics, as well as an MA in International Management from London School of Economics, through the CEMS MIM Programme. A native Swedish speaker, she has worked for organisations of all sizes, from BlackRock and Handelsbanken Capital Markets to small specialised firms. She has managed projects in the UK, Europe, Australia, the Middle East, and Sub-Saharan Africa, having worked mainly within the infrastructure sector. Sound Diplomacy has offices in London, Berlin and Barcelona, and is in the process of opening an office in the United States, later in 2019. Sound Diplomacy have expanded its global footprint developing music strategies around the world and advising the real estate sector and large, international organisations. Known for expanding the ‘music cities’ model, which sees music strategies incorporated into cities’ economic development, tourism and industrial expansion plans, Sound Diplomacy count amongst its clients Greater New Orleans Incorporated, Lendlease, Greater London Authority, United Nations Industry Development Organisation (UNIDO), UN Global Communications, City of San Francisco, Walton Family Foundation, Legal and General, Indianapolis Chamber, City of Huntsville Alabama, Manchester City Football Club, Madison Square Garden and the City of Brisbane. The firm also convenes the leading global suite of conferences on the role of music and public policy, including Music Cities Convention (in partnership with Martin Elbourne of The Great Escape, Glastonbury and NH7 Festivals), Music Tourism Convention and Sound Development. Over 200 city representatives have attended their events, from all continents bar Antarctica. Sound Diplomacy is thrilled to continue to develop and champion a model that demonstrates the economic value of music in cities, towns and places around the world, with Julia at the helm. Former CEO Shain Shapiro will move on to serving the company as its Founder and President.